After trying lots of different chest protectors, researching the safety standards, and price shopping, I think I finally found the best dirt bike chest protector on the market. The first and most important quality of a chest protector is the level of protection it provides. The second most important quality is the comfort. You’ll struggle to wear it if the collar bites into your neck while riding, or it restricts your movement too much. So choose a good quality brand, and make sure you get the right fit. After lots of testing, wasting money on junky ones, and trying on just about every chest protector out there, I finally have a good recommendation. The chest protector that I recommend for most dirt bike riders, and the one that I personally own, is the Leatt Adventure Chest Protector (available on Amazon.com). I purchased the Leatt Adventure because I think it’s important to have some coverage on the shoulders, but if you want to go with a lighter option, the Leatt Adventure LITE Chest Protector (link to Amazon) is also a good option. The Adventure Lite is actually Leatt’s best-selling chest protector. What I like about the Leatt is that it offers a basic CE rating at EN 14021 and offers some shoulder and clavicle protection, it is lightweight and very breathable, and the price is reasonable for a very high-quality piece of gear. They also look cool, have tons of vents, and integrate well with neck braces if you ever decide to wear one. Either the Leatt Adventure or the Leatt Adventure Lite can be worn over or under the jersey. I personally wear them under the jersey and they don’t bulk it up too much. I wasted money on buying inferior quality before I finally decided to buy a good chest protector. At first, I bought the cheap Chinese one on Amazon I had heard about, which broke within 5 rides and was very hot and uncomfortable. I wished I had spent just a little more money the first time and had bought something of good quality. This is the chest protector you can buy today and still be using 10 years from now. Buy right, buy once. Roost Deflectors vs Chest Protectors: NOT the same thing! Unfortunately, gear manufacturers don’t make it clear when you purchase body armor that roost deflectors and chest protectors are not at all the same thing, and it’s a mistake that could cause serious injury. Many dirt bike riders buy a cheap Fox clear-plastic roost deflector and mistakenly think they are protecting their shoulders, ribs, kidneys, and clavicle (all frequently injured areas). Unfortunately, that’s not true at all. In fact, some riders have reported these roost guards sliding up and cutting them under the chin in an event of a crash. A roost deflector’s only job is to keep your body from getting cuts and bruises from whacking into branches while riding in trees, or from roost (dirt and rocks kicked up from another rider). It is not designed–at all–to protect your body in the event of a crash. A roost guard has no CE certification for impact, while a good chest protector does. CE EN 14021 – No significant gaps in the coverage area. Coverage area must cover the front portion of the rib cage and sternum. Shoulder, bicep, and back guards must also cover main areas. Should be capable of reducing energy throughput of a 10J force from a dropped weight to fewer than 27kN of. Very few chest protectors meet the more stringent 1621-1 standard which is designed not for small impact, but for blunt impact to the body as with a fall rather than debris hitting the body. There are a few CE EN 1621-1 approved chest protectors on the market such as the Leatt 5.5 Body Protector HD. While having the extra protection is great for peace of mind, most riders find it far too heavy and hot, and eventually switch to something a little lighter that still has good protection like the Leatt Adventure that I recommend buying on Amazon. If you’re into your trail riding I also suggest you buckle up your body armor to protect your vital organs from being skewered by tree branches. I have heard some real horror stories of guys being stabbed through their chest and/or shoulders after accidentally taking on trees… not fun. A good quality chest protector (body armor) is an essential piece of riding gear if you are serious about your safety, and may just save your bacon one day. There is a valid reason why you should wear one, and that is to protect your shoulders, chest, back, ribs and pretty much all of your internal organs from injury caused by various types of impact. They are a ‘must have’ for roost protection when racing – yes, having fist sized clumps of dirt and stones roosted into your bare chest does hurt! The trend in the last few years is the “air” style chest protectors. These are basically just a compression tank top with some dense foam or a combination of mostly foam and a little plastic. This style is designed to be worn under the jersey. I personally am not a fan of this style simply because I don’t think they offer enough protection. To me, it’s simply not worth the risk of needing clavicle surgery or having chronic shoulder problems because you decided to skimp on body armor for one dirt bike ride. A few popular examples of this style of chest protector are the Fox Titan Race, or the Fox Titan Sport Roost Deflectors. This type of chest protector is a step up from the cheap clear-plastic roost deflectors, but I don’t think they are protective enough and put the rider at an undue risk with only a slight comfort advantage. 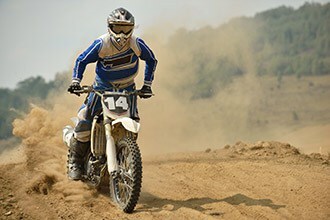 Many enduro riders prefer to wear jacket-style dirt bike armor instead of a traditional chest protector. In fact, this is what I bought when I first got my dirt bike. It seemed convenient to have a chest protector and elbow pads all wrapped up into one jacket that you can throw on under your jersey. However, I personally didn’t like this style of protection and ended up buying something else. The problems with jacket-style armor are threefold: (1) The jackets do not allow for individual placement of the pads, so some body types will end up with pads not covering where they should, (2) The jackets are almost always hot, and (3) You pay more for a jacket and if any one piece breaks, you have to replace the whole thing. With individual pads, you can just replace a part of the armor. However, jacket-style body armor has some distinct advantages–especially safety. You can get jacket-style armor that has much better armor coverage than a traditional chest protector and elbow pads. Jacket armor will often cover the entire length of the spine, kidneys, and other areas that often aren’t covered. Fitment of Jacket-Style Pads: The problem I had with several jacket-style body armors that I tried on and bought was that they did not always fit right. Since the pads are sewn into a jacket, if the pads don’t line up right on your particular body shape, there is little opportunity for adjusting them. I must have longer upper arms because several that I tried had elbow pads that sunk slightly below the elbow. There are some adjustments available on these pads depending on the brand, but the pads likely won’t line up as well as individual pads. Heat with Jacket-Style Armor: I also did not like how hot jacket-style armor gets. The increased safety from more plastic parts also means more heat build-up. If you plan on just wearing a jacket with no jersey, then it’s probably fine; however, if you’ll be wearing a jersey over your body armor, I found it to be too hot for summer riding. Price of Jacket-Style Armor: Jacket-style armor is usually slightly more expensive than simply buying a chest protector and elbow pads. Adjustable shoulder straps offering flexibility in the shoulder area. Cooling vents to allow airflow to your body. Good padding esp. around the neck and shoulder area. Flexible plastics to allow it to move and conform to your body. Designed to be used in conjunction with the Leatt-Brace or other neck braces. Available in various sizes and colors. These snug fitting roost protectors fit under your shirt out of the way. When you see the pro’s riding and it looks like they aren’t wearing body armor – they are, underneath. They have bio foam liner which can help soften the blow on impact. I own this exact model and it does the job nicely. TIP: When cleaning your chest protector it pays to use a sponge with water. Some warranties become void if you use chemicals as it can weaken the materials. Also, try keeping the straps buckled together when not in use to help prevent the buckles from snapping in storage. Hi! I'm Jim Harmer and this is the place where I nerd out about dirt bikes. As an avid dirt biker (I ride a Yamaha) with a family of dirt bikers (3 kids and a wife), I love getting out in the mountains and riding trails for hours. On this blog I share all the things I learn about dirt biking as I go. 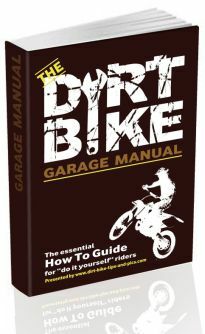 The Garage Manual has all the info you need to keep your dirt bike maintained and running great! This site is owned and operated by Income School LLC. Income School LLC is a participant in the Amazon Services LLC Associates Program, an affiliate advertising program designed to provide a means for sites to earn advertising fees by advertising and linking to Amazon.com. Income School LLC also participates in affiliate programs with Bluehost, Clickbank, CJ, ShareASale, and other sites. Income School LLC is compensated for referring traffic and business to these companies. What brand of dirt bike does Dwight Schrute ride? Polaris Ranger 150 Review: Is it better than the RZR 170?